Taking control of your inbox using Outlook and the method below is a great way to get your anxiety down and productivity up, but there are a few limitations you need to be aware of before we get into the nitty-gritty of setting it all up. All the cognitive techniques described below can be used with or without Outlook, but I spent years trying to take control over my inbox before I managed to do it and I discovered that, at least for me, it had to be simple and quick. The program I use has to be able to support the process all the way. Outlook is one such tool I use. Remember the Milk and Trello are two other. I gladly separate them even though productivity experts say you shouldn’t. I can do this since they each represent different types of todos. 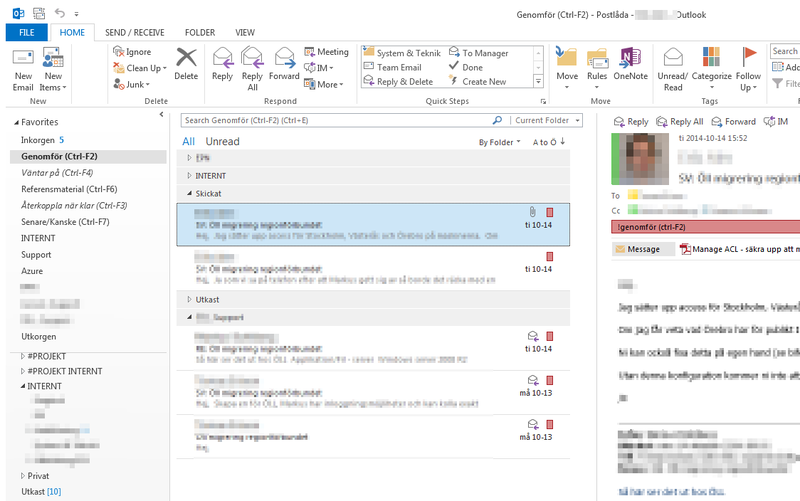 Outlook is for work-related todos. And they shouldn’t be mixed up with other todos. After all, you want to keep work and personal life separate. Or at least I do. 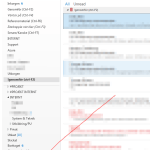 Some of the features used in this article only exist in the desktop application of outlook (not the phone, and last I checked, neither on the web). You can read mail and tag them on the phone/web, but you won’t have access to the search folders. Outlook for Mac doesn’t have search folders, so it also has to be the Windows version of the desktop application. I’m a Mac/Linux user (you may even call me an aficionado) but I get Outlook on my work laptop, so I keep track of my work-related todos on it and it works out just fine. The method described below will only track mail. I don’t know if it can also track todo items. I personally find the todo functionality of Outlook confusing and gave up on it more than a decade ago. If you need to give yourself a todo or reminder. You can just send an email to yourself, or even create a draft without sending it. Then you’ll process it and categorize it using the below method and your inbox will be shiny clean and empty again before you know it. In order to get everything working according to this method, you’ll have to do some setup of Outlook. This only includes using Outlook functions such as search folders and add items such as regular folders and categories with keyboard shortcuts. There is absolutely 0% registry hacking going on in this tutorial! I am using Outlook 2013, but I’ve used this technique for years. I am not sure what version of Outlook I started with, but all versions I’ve used can do this. Some older versions required a bit more tinkering with Search Folders than later versions, but that’s about it. In order to keep your inbox empty, you obviously have to move your mail to subfolders. However, things that need your attention in some way needs to be tracked. You do this by using Categories combined with Search Folders. The first step is to set up your categories in Outlook. Also, add the shortcut key to the name (this will make it much easier to decategorize mail later on). Categories represent (for instance) contexts in Getting Things Done, so if you know GTD, you can add more categories. However, remember that you need Outlook desktop to do this and you’ll want all categories and a handful of important project folders on the Favorites pane, so your number of possible/useful categories are limited. Access the list of categories, e.g. by right-clicking a mail and selecting “Categorize > All Categories”. 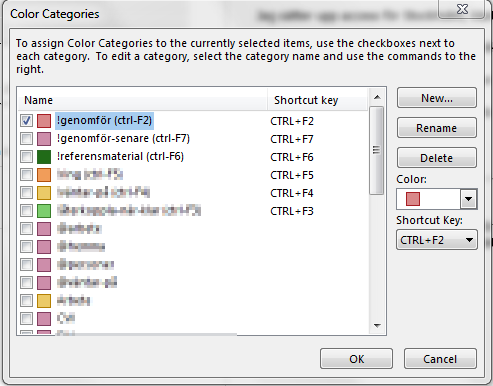 Create each category, assign a color and a shortcut key. The shortcut key is important! My to-do category is literally named “To do (Ctrl-F2)” and it has the shortcut key ctrl-F2 attached to it. The next step is to create Search Folders that will display email belonging to the different categories you’ve set up. You want one Search Folder per Category. To create a Search Folder, right-click “Search Folders” and choose “New Search Folder”. 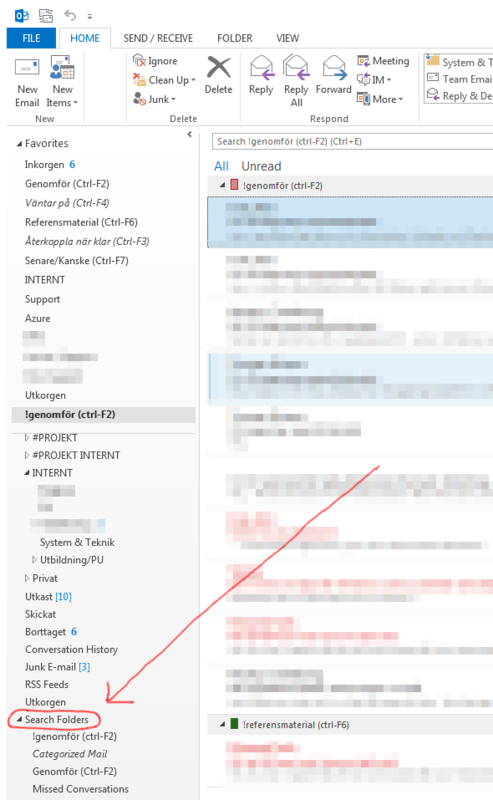 You find “Search Folders” at the bottom of the list of nodes on the right side of your Outlook. The “New Search Folder”-dialog is displayed. Select “Categorized mail” under “Organizing Mail” and choose your category by clicking “Choose…” and select the category in the new dialog. A new Search Folder will be created using the name of the selected category. 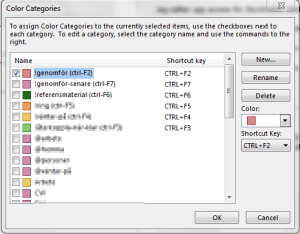 You change this name by right-clicking the folder and select “Customize this Folder”. Right-click the search folder you just created and select “Show in Favorites”. Repeat the above steps for each of the categories you have created. You can drag the folders in the favorites list to organize them in the order you like. At this point, you have Search Folders that are organized by category. This is a bit redundant. We want them to be organized by folder instead. Search Folder sorted by Category. 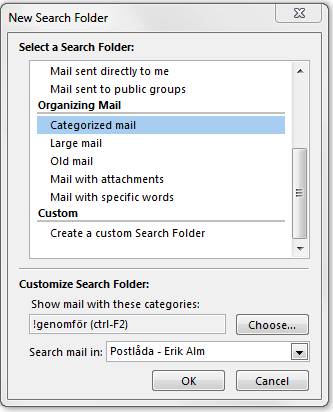 In order to organize a search folder by folder click the “By Categories” option in the header of the mail-list in the search folder and change it to “Folder”. Now your Search Folder is organized by Folders instead. Repeat this step for each of your Search Folders. To get the most out of this method, organize your mail in folders. You create a folder by right-clicking the node you want to be the parent (I have all my folders under “Inbox”, but the search folders will find mail anywhere else as well). Select “New Folder…” from the menu, give the folder a name and press ENTER. You may also wish to place your folders in a main folder for all customer projects and have another main folder for your internal projects. Guess what? Outlook lets you rearrange your folders to your heart’s content because the Search Folders find your mail regardless of their location. In order to make it easier to arrange your inbox you can mark the folders of your most active projects as “Favorites”, thus making them accessible in the favorites list along with the search folders. Then, in order to move a mail to this folder, just drag it to the folder in the favorites view. Unfortunately, this does not work for categories. You cannot drag a mail to the Search Folder for a given category to assign it to that category. This is why your categories need shortcut keys, and why it’s a help to display the shortcuts in the category and Search Folder names. Now it’s time to test your set up. Does it require you to perform some kind of action? Does it contain reference material? Such as contact information, time reporting codes, links, etc. Are you unsure what the mail is about or what to do about it? If the mail does not require you to do anything, and it does not contain any reference material you need to save, don’t give it any category and it will be out of your hair once you move it out of the inbox. Finally, move the mail to the customer/project folder. You move the mail out of the inbox regardless of if you have to act on it or not! If you’re worried that you’ll lose the mail, verify in any of the search folders of the categories you’ve given the mail that it appears there as well. 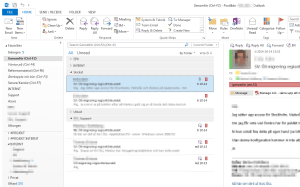 Then move the mail from the inbox to the customer or project folder it belongs to. If you have 500 emails in your inbox, you don’t have time to read epic-size emails from your colleague three cubicles over. Just mark it as “to do” or “maybe/later” and move on. You should be able to perform the initial sort of a 500-email inbox in about an hour, so make snap decisions about if it requires your attention or not. You’ll get back to do the actual work later. Initially, your primary goal is to empty the inbox and give each mail a quick glance and perhaps a category. Productivity experts have a rule of thumb that if you can finish the task in under two minutes you should go ahead and do it immediately. This tip comes from the era of folder archives and paper binders (or whatever). A time when it took more than two minutes to create a to-do-list item! You’ll notice that you can categorize and move an email in seconds… two minutes is an eternity in this context! I recommend that you move all the emails and then get back to them once the inbox is empty. If you’re not sure what to do with the mail, mark it as “To Do” and move on to the next mail. You’ll have plenty of time to find out what you’re supposed to do once your inbox is emptied. The point is, if you organize your mail by folders, your to-do list (and all the other Search Folders) will also be organized by folders. In most cases, you have an inkling about what project needs your attention most, or what priority different projects have, so just open the most important project and start working on the emails from that project. You can try this with a couple of emails in order to test that you’ve set things up correctly, but in order to keep your inbox clean (and your stress levels sane), you’ll have to move your mail out of your inbox before you start working on them. Note that you can select more than one e-mail at a time and both categorize them and move them. 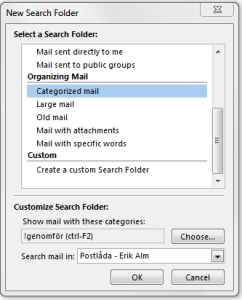 You can also assign several categories to one mail, making it appear in several Search Folders at the same time. Once you’ve emptied your inbox, open the “To Do” search folder, and start working on the e-mails (replying to them etc). Once you’re done, pressing Ctrl-F2 (or whichever shortcut key you gave the To-Do category) once more will decategorize the mail as a “To Do” item and remove it from the “To Do” Search Folder, leaving room for the next item on the list. If you are working on emails in other Search Folders, you use the shortcut key for that search folder to decategorize the email and make it disappear from the search folder. The mail will still be located in the customer/project folder if you need to get back to it later. I have a category for reference materials in my set up (logins, project plans, time reporting stuff etc) but I also use a number of other programs to organize my reference material such as Wordprocessors, text editors, markdown-editors, etc. And I keep it all in my Dropbox. I keep logins and similar information in my LastPass account. So even if I have a reference materials category, I only use it to store information temporarily, all to clean up my inbox quickly. Some of this information is only needed for a short period of time and never makes it past my Outlook folders. I also use my calendar – for events and actions that must take place on a certain date and time. This could be meetings, prearranged phone calls, and other events with a schedule. I do not, however, place my to-do items on my calendar. The main reason for this has to do with priorities. I want to handle my tasks in priority order, but having them arranged on a calendar will break down as soon as a “higher” priority task comes in. I’d have to rearrange my calendar, and if I can’t finish the tasks for the day, I may have to rearrange several days or weeks worth of planning. Also, if someone wants to book a meeting with you via the Outlook calendar system they won’t see what the appointment on the calendar is about, only that you’re extremely busy. Another reason for keeping my tasks away from the calendar is that it requires me to plan ahead, much farther than I feel like, and it forces me to do some task at a specific moment in time, while I might feel like doing something else instead. Besides, moving every mail that requires me to do something to the calendar takes time and may encourage me to try to deal with the mail at once instead of categorizing it for later – which in turn means that if I cannot handle my whole inbox, it starts to grow, and I start losing track of what it contains. And I am back where I started. What about the Maybe/Later categories? Did you create “Maybe” and/or “Later”-categories? These are different from the to-do category in that they can contain things you can’t do immediately, as well as things you may be able to do immediately but have decided to postpone. If you have time to spare, which may or may not be likely in your specific case, you can always go into the maybe/later categories and work on those to-dos. If you do not have time to spare, you need to tackle these folders in a more organized manner. You do this by scheduling recurring checkups with yourself. A good practice is to sit down once a week and plan the coming week. This sitdown will be more about immediate tasks. You may also want to sit down once a month and once a year and plan those, but then we’re getting into longer-term life planning, and I recommend that you look into Getting Things Done for a deeper discussion on that. The cons of this approach are that you now have your unhandled mail in several folders. You can still find them if your categories would get lost or your Search Folders get damaged (something that has not happened to me despite several upgrades and reinstalls – my categories and “Search Folders” are, however, located on my company’s Exchange server…) or, more likely, you find yourself on a phone or the webmail, where there are no search folders. This setup is a bit more technology intensive than just keeping everything in the inbox, and there are more places where things can go wrong. You’re also not able to use this method in webmail or on the phone. Your Search Folders aren’t visible, but you can still categorize mail, and move them to folders, just not view them in any sensible way. The pros of this approach are obviously that, instead of having a seemingly huge pile of unread, unanswered emails in your inbox you can quickly categorize them to weed out those that don’t actually require your attention. You also get a firmer grip on what’s in your inbox (or in fact what was in your inbox). There’s no black holes or unknown horrors lying in wait because even if you just scanned each mail, you’ve seen it and have a much better idea of your workload. You also become more agile and able to act more by priority than if you were to just handle one mail at a time until the inbox was emptied. Having seen all the emails once gives you a much better idea of what your priorities should be. And finally, you get to know that you are in control of your inbox — perhaps just a small piece of the world, but a piece of the world you now master! How do you keep track of your email and to-dos? Do you use a method to keep track of your emails and to-dos? Do you use programs or online services? Tell us in a comment! The header image of this article is from Flickr (created by Jason Rogers).